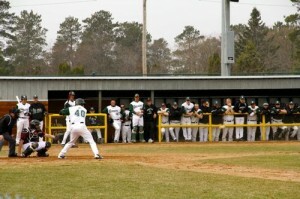 Junior outfielder Trevor Purvis bats in Saturday's game against the UMD Bulldogs. The Beavers won both games Saturday. Photo by Mike Chambers. The Bemidji State baseball team opened its conference home season, splitting a four-game weekend with Minnesota-Duluth last weekend at the BSU baseball field. Both wins came on Saturday in dramatic fashion. After being no-hit for the first five innings in the first game Saturday, the Beavers offense came to life in the bottom half of the sixth by putting up three runs to take a late 3-1 lead. Chad Hanson and Jaryd Marks each scored and picked up RBI hits in the inning. Phil Bray was able to shut the door in the seventh inning to earn his team-leading fifth win of the season. Bray, now 5-1, pitched all seven innings and allowed just the one run on six hits. He struck out six and walked one. Collin Stinogel took the loss for UMD, allowing three runs on three hits in six innings of work. He walked two and struck out four. BSU jumped ahead to an early 2-0 lead in the third inning thanks to pair of home runs from Travis Purvis and Logan Kalis. Kalis finished the game going 3-for-5 with two runs batted in. After allowing a run in the fourth the Beavers added three more runs in the bottom half and another run in the fifth to build a 6-1 lead. Marks and the Beaver defense stumbled through the later innings, allowing three runs in the seventh and a pair in the eighth to see the five-run lead disappear. Marks worked 7.2 innings and allowed six runs, four earned, on eight hits. With the score tied a six in the bottom of the ninth, Kallis doubled in between a pair of walks and BSU had the bases loaded with just one out. Juan Molero’s fly ball to the outfield was deep enough to send the Beavers home with a 7-6 win. Kaleb Dingman was the pitcher of record for BSU. He worked 1.1 innings and allowed two hits. The offense did not carry over into Sunday for the Beavers. They only managed two runs on ten hits in the two games. After allowing just one hit over the first five innings, Kalis allowed two hits in the sixth, but was doomed by a pair of costly errors that were responsible for bringing in three runs for the Bulldogs. BSU scattered four hits in the game but never scored. Kalis pitched all seven innings, allowing the three unearned runs on three hits. He struck out four and walked three. The Bulldogs jumped on Miles Campbell and the Beavers in the second game by scoring two runs in the top half of the first. After falling behind 5-0, BSU put two runs up on the board in the sixth inning to cut in to the deficit. Both teams continued with the offensive pressure throughout the later innings, but it was UMD who scored the three runs. The Beavers stranded six baserunners throughout the final four innings. Campbell, now 1-3, took the loss for the Beavers. He allowed five runs, two earned, on nine hits in six innings of work. He struck out three and walked one. Bemidji State (12-5, 5-3 NSIC) will return to action this weekend in a pair of doubleheaders against Upper Iowa.